Field of plants in Fuertaventura, Canary Islands, Spain. The plant is a very popular herbal medicine that has a history of use dating back to at least 400 BC. It is widely cultivated, from warm temperate to tropical regions, as a medicinal plant and ingredient of skin care products. It is also commonly grown as an ornamental in gardens and as a pot plant in regions where it is not warm enough to grow it outdoors. Only known as a cultivated or naturalized plant., it is generally presumed to have originated in Arabia, Somalia or Sudan. ]. All parts of the plant can be used, but the two most common parts being the clear gel contained within the leaves and the bitter exudate at the base of the leaf. Several studies on both topical and oral treatments with the gel have shown a positive influence on the synthesis of glycosamino glycans, thereby facilitating wound healing. A placebo-controlled, double-blind study showed that a topically applied gel of 0.5% in a hydrophylic cream is beneficial for patients suffering from psoriasis. It did not show toxic or other side-effects. A clinical test with patients with advanced solid tumours, for whom no standard effective therapy was available, suggested that the gel, in combination with the immunomodulating neurohormone melatonin, may produce some therapeutic benefits, at least in terms of stabilization of disease and survival. Excellent guide to pollution in the home and those plants that can help to remove the problem. Most of the plants are not hardy outdoors in the temperate zone, though a number of species can be grown outside. Seed - sow in seed trays in a lightly shaded position - the seed usually germinates in 1 - 6 months at 16°c. Prick out the seedlings into individual pots of very well-drained soil when they are large enough to handle and grow them on until large enough to plant out. It's common names are: Acibar, flor del desierto, linalóe, penca sábila, pet’k’kim-ki, sábila, zábida, zábila [spanish]. Aloès, Aloès vulgaire [french]. 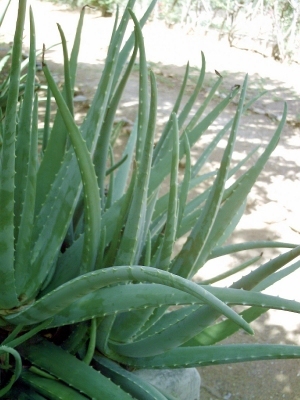 Aloe, Barbados aloe, coastal aloe, Curaçao aloe, Indian aloe, Jaffarabad aloe, medicinal aloe, mediterranean aloe, star cactus, true aloe, West Indian aloe [english]. Humpets’k’in’ki, pets’in-ki, pet’k’kim-ki [mayan].